Want a romantic gift for a 10th wedding anniversary? Tin and Aluminum are traditional choices for 10th Wedding Anniversaries. 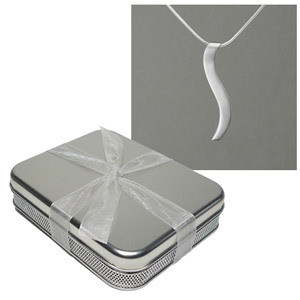 Consider this unique silver jewelry which we pack in an elegant tin gift box. 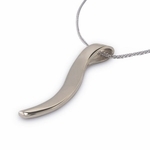 Open this box to reveal a sterling silver Ogee Pendant and snake chain. This is the "Connection Necklace." The double-curve shape of the 'Ogee' is inspired by the line of connection found in the traditional Asian symbol for balance and harmony. Its design represents the point of connection between 2 people. This Ogee Pendant is an original design by Richard W. Berman, combining beauty and meaning in a single timeless design. See our full selection of 10th Anniversary Gifts or Matching Earrings. Customer Reviews for "10th Anniversary Gift Tin with Silver Connection Necklace"
"I had a phone conversation with the merchant prior to the sale.He asisted me with a shipping question,told me he would take care of it and he did.Great transaction,very nice quality item.Honest and helpful,I will buy from again. Thank You," - Grady Sullens.